What do discussions on social media platforms tell us about political behaviour? Pablo Barberá and Gonzalo Rivero outline results from a study of 12,000 Spanish Twitter users during the 2011 Spanish general election and 50,000 American Twitter users during the 2012 U.S. presidential election. They find that users who were on the extreme left or right of an ideological scale played a disproportionately large part in political discussions during the election campaigns. They suggest that caution should therefore be exercised in using Twitter as a reliable source for gauging public opinion. The increasing use of social media platforms has generated great expectations regarding their potential to transform political communication and the interactions between political elites and citizens. However, the way in which tools such as Facebook or Twitter affect different modes of political participation remains an open academic debate. Over the past few years, scholars have examined how social media affect the emergence of mass protests and revolutions, to what extent they allow minority voices to be heard, how they increase citizens’ access to a greater diversity of political views, or even whether it is possible to use social media data to predict political events such as elections or demonstrations. A common element to most of these analyses is the claim that social media democratises access to public communication. Since they homogeneously reduce the cost of broadcasting messages to a large number of individuals, independently of who the sender is, it is often argued that social media should contribute to the quality of political representation. However, as we demonstrate in a new study that uses Twitter data, this is not the case. Quite the opposite: political actors with a larger presence in offline public debates remain central on social media websites, which intensifies biases in political participation. This finding also calls into question the potential of social media data to become a reliable source of information about public opinion. This core finding is intuitive, and illustrates the difficulties associated with the use this type of data. Analysing Twitter is not very different from walking into a noisy bar. We can hear voices, but we have very little information about the subjects. We can hear people speak and we can observe who is listening and to whom, but we cannot pose any questions. We are surrounded by data, but as in most cases when it comes to analysing politics and the Internet, we are still learning how to exploit the information to which we now have access. By studying online interactions, however, we can contribute to the development of tools that allow us to understand how Twitter works as a first step prior to developing theories and narratives about the relationship between social media and politics. Our research is part of a larger research project, tuitometro.es, which we launched in 2011 and which aims to measure public sentiment about relevant political events in real time using Twitter data. We use a dataset that includes all tweets mentioning one of the two major candidates competing in the 2011 Spanish general election and the 2012 U.S. presidential election over a 70-day period prior to each election. These datasets are complemented with an in-depth analysis of a random sample of 12,000 (Spain) and 50,000 (U.S.) Twitter users who participated actively in Twitter conversations during our period of analysis, for which we estimated relevant socio-demographic and political variables. Analysing this data yields four main conclusions. First, we find that most users who write about politics on Twitter are male. Second, even if the geographic distribution of Twitter users in each country resembles that of the general population, there is a clear bias in favour of urban areas. Third, political discussion among active Twitter users appears to be highly polarised: users with clear ideological leanings are much more active and generate a majority of the content. Finally, we find significant differences in the patterns of discussion over our period of analysis: in both countries, campaign events increase or diminish inequality in participation on Twitter, leading to changes in the extent to which political discussion is dominated by a small number of users who are very active. Perhaps our most interesting result is the one concerning the relationship between ideology and participation on Twitter, which we illustrate with the figure below. Regarding the distribution of users according to their ideological identification, they are divided in almost identical proportion between right and left, conservative and liberal in both countries. Second, we find that the activity of users whose ideological positions are distant from the ideological centre is higher with respect to the number of tweets, retweets, and “@ replies” they publish. In other words, this result suggests that the political discussion on Twitter is mainly driven by citizens with extreme values on the ideological scale. Note: Each dot represents a set number of Twitter users, the location on the horizontal axis indicates their ideology, while the height on the vertical axis indicates how many tweets were sent by users. The line shows the general trend, indicating that in both Spain and the United States, a higher proportion of tweets were sent by those users on the extreme left and right of the ideological scale. See the authors’ longer paper for full calculations. 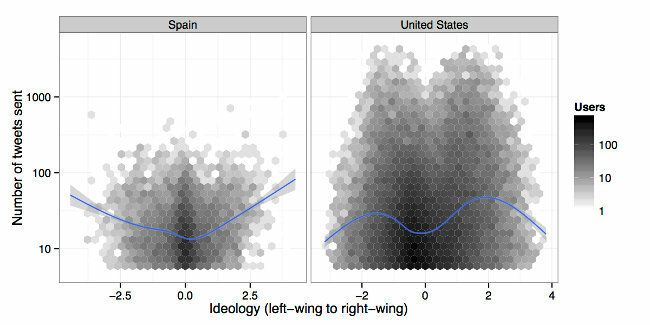 When we divide the sample between right-wing and left-wing users (or conservatives and liberals), we also find other relevant asymmetries. For instance, although in the Spanish case the total number of tweets sent by each group is roughly similar, conservative users retweet at a considerably higher rate than liberal ones. This behaviour suggests that the political discussion among right-wing voters is more hierarchical and structured. In the U.S. we also find significant differences between ideological groups, but at a deeper level. The users we classify as conservatives tend to be more active in general, with a higher number of tweets coming from this side of the ideological spectrum. The implications of our study depend on the use that researchers intend to give to Twitter data. From an applied perspective, if we are interested in it as a source of information for political and social analysis, our results raise concerns about its potential, given the biases we have discovered. Any analysis based on the volume of tweets or their “sentiment” will inherently be unreliable if it does not account for the factors indicated above. In this sense, our criticism is constructive, since we are quantifying the variables that will require the most attention in future statistical analyses of Twitter data. From a more general standpoint, our results underscore the idea that Twitter, just like any other communication tool, reflects the existing patterns of inequality. The use of social media platforms represent an important transformation – but not a revolution – in how societies communicate. Despite the growing body of work on social media and politics, there is still much to be learned. It is possible that Twitter is capturing the opinion of an informed and influential minority that creates opinion changes in the entire population, including those not present on social media sites. The scholarly work on the connection between offline and online political behaviour is still at its infancy, but shows great promise. A rigorous analysis of this new source of data requires developing new and more sophisticated methods, to which we hope to contribute with our work. Pablo Barberá is a Ph.D. candidate in the Department of Politics at New York University and a graduate research associate in the Social Media and Political Participation lab. His primary areas of research include social media and politics, electoral institutions and behavior, and political corruption. Gonzalo Rivero (Ph.D., New York University) is statistical scientist at YouGov America. His academic research is focused on political methodology, voting behavior, and electoral accountability.